McElroys is proud to announce that it has won the Insurance Specialist Law Firm of the Year award. 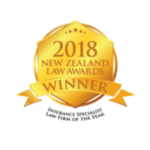 On 15 November the McElroys team attended the New Zealand Law Awards at The Cordis Hotel with high hopes of bringing home the trophy, and did so. It was a great night. Key Media put on a fantastic event, with the team finishing the night dancing to the inimitable Annie Crummer. Winning the award was a welcome affirmation of McElroys’ hard work and dedication. It also coincided with the rebranding of the firm, a process through which we honed the values that form the foundation of the McElroys service. These are based around problem solving, collaboration, and being straight in our specialist field. Being named Insurance Specialist Law Firm of the Year has been the cherry on the top of a very successful and fulfilling year. We are poised to make the coming year even better.